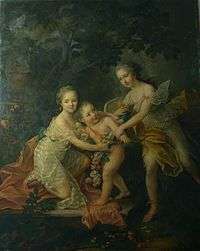 François-Hubert Drouais (December 14, 1727 – October 21, 1775) was a French painter and the father of Jean-Germain Drouais. Drouais was born and died in Paris. He specialized in portraits of the French nobility, foreign aristocrats, writers, and other artists. He was a pupil of Donat Nonnotte. 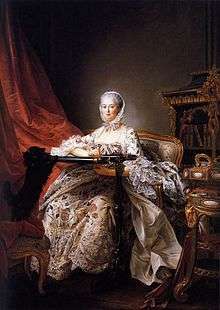 Some of his portraits include Louis XV's last two mistresses, Madame de Pompadour and Madame du Barry respectively. He even painted the young Marie Antoinette. ↑ Birmingham Museum of Art (2010). Birmingham Museum of Art: Guide to the Collection. London, UK: GILES. p. 192. ISBN 978-1-904832-77-5. Retrieved 2011-06-16. 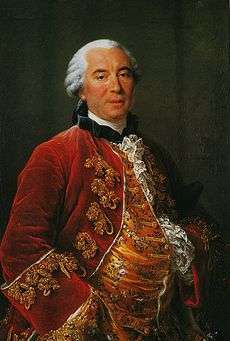 Wikimedia Commons has media related to François Hubert Drouais.